for KING & COUNTRY – RUN WILD. LIVE FREE. LOVE STRONG. After the release of their first album, Crave, popular opinion was that for KING & COUNTRY was a band to watch out for. With the upcoming release of their sophomore album, RUN WILD. LIVE FREE. LOVE STRONG., they prove that they are a force to be reckoned with. Opening this record is a song titled “Run Wild”, a great collaboration with fellow artist Andy Mineo. When I saw that Andy was a guest on this song, I have to admit that I wondered how it would turn out. But the rap vocals that he adds tie in nicely and are not overly powering, but a creative addition to the pop sounds of for KING & COUNTRY. It’s a challenge to you, the listener, to leave “it” all behind: your reputation, your success, and your comfort. Following is a short prelude to the third track, “Fix My Eyes”, which has already seen much success as the first radio single from RUN WILD. LIVE FREE. LOVE STRONG. Track 4 is one of my many favorites off of this album, titled “To The Dreamers”. It is a song to those who feel down and out, and a great encouragement. The next song “Shoulders” is one of a couple of songs on this record about one of the two brothers of for KING & COUNTRY, Luke, and the sickness that he has battled while writing this record and while touring for over the past year and is based off of Psalm 121. The chorus of this song, ‘My help comes from you; you are my res- my rescue; I don’t have to see to believe that you’re lifting me up on your shoulders’ is a reminder to all of us that our help comes from God alone. A couple songs down from “Shoulders” is another personal song about Luke’s sickness: “Without You”. This beautiful song was written after Luke’s wife Courtney (who lends her beautiful voice for this song) came to him after a particularly rough night and said “Luke, you just can’t leave me here.” Some of the more powerful lyrics on RUN WILD. LIVE FREE. LOVE STRONG. are found in this song: ‘This thorn in my side though it cuts and stings me; has opened these eyes; I’ve never seen so clearly; and oh God I thank you; cause you bring me to my knees; back to my knees’. It serves as a reminder to all of us that we should always thank God, both in the good, and the bad. Further down a love song makes an appearance in “This is Love”. This song holds the promises of marriage: ‘for richer or poorer; better or worse; we’ll be together; we’ll make it work; love is patient; I know love is kind; thank God I saw the sign’. Closing out RUN WILD. LIVE FREE. LOVE STRONG. is yet another personal favorite. A slower ballad titled “O God Forgive Us”, it is about that, asking God to forgive us and our unbelief. As the song ends it builds up louder and louder with the lyrics ‘With our white flag sailing in the night; eyes pointing to the sky; hands up and open wide, open wide’ being repeated over and over. If you stick around until the very close of the entire album, you will be gifted with a treat. If you enjoyed their “The Proof of Your Love (The Monologue Mix)”, that was released after Crave came out, you will enjoy this ending as well as Joel explains what RUN WILD. LIVE FREE. LOVE STRONG. is about. 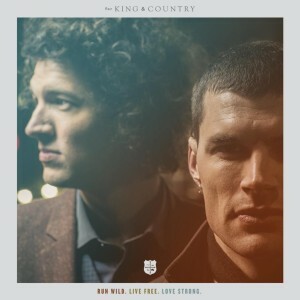 for KING & COUNTRY will only gain more fans after the release of RUN WILD. LIVE FREE. LOVE STRONG. If you’re a fan of music in general, you should waste no time in picking up RUN WILD. LIVE FREE. LOVE STRONG. Check out official audio videos for a few songs below as well! And below are the song stories of some tracks! Great review Emily, I absolutely can’t wait to get this. I’m picking it up with some birthday money next month, so I’ve got a little while longer to wait yet My favourites are definitely to the Dreamers, Shouder, No Turning Back, Without You, Long Live, Already Home, and O God Forgive Us. An AOTY contender for sure! I agree, Luc, definitely an album of the year contender. In fact, I’d go so far to say that it’ll be nominated at next year’s Dove Awards for Pop album of the Year- and will probably even win it as well. Not sure if I would say AOTY for me (MercyMe and Francesca Battistelli are #1 and #2 on my list), but definitely #3. Bellarive and Jason Gray would round out my top 5, with Lindsay McCaul and Moriah Peters’s albums following close behind. Great review, Emily. Yeah, I also love the album too. My favourites would have to be Fix My Eyes, Shoulders, No Turning Back, Long Live, Without You and Steady. Definitely one of the albums up there for my favourite albums of 2014 so far. I love this album so much and yes, I agree with Luc that it’s an AOTY. That’s what I thought of this morning as I was getting ready for work. You can hardly fault any song on this album. This is a great review but what I really don’t like is that not all the songs are assessed. Yeah, I do agree that it could all be possible to have each song as your favourite- for different times of the day and different days of the week. I will try doing that Jon. Thanks. I love this album too, Mercy, and it’s definitely in my top 5. I think it’s only my own reviews and Jon’s that talk about almost every single track. As for the other reviewers, they have their own style that’s unique to them And that’s ok, it makes this site diverse, vibrant and enjoyable to visit!